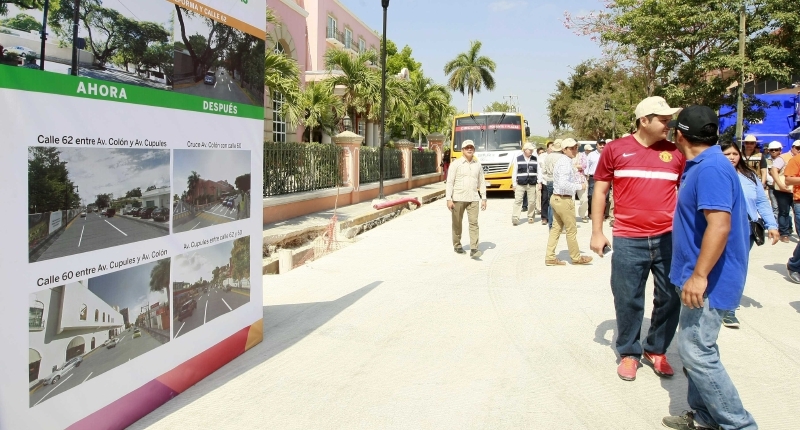 The administration of Yucatan Governor Rolando Zapata Bello is proceeding with the repair and improvement of Merida’s Colón Avenue, but the person in charge of the stretch in the hotel zone, José Miguel García Vales, revealed that the new street of hydraulic concrete rose a few centimeters, almost imperceptible to people, but sidewalks will be at original street level. 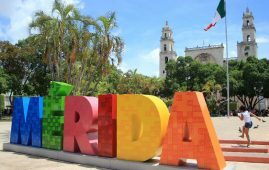 “You don’t want to flood the hotel,” Hyatt Regency Hotel Manager Richard Westell told the governor and Gilberto Enríquez Soberanis, director of the Institute for Construction and Conservation of Public Buildings in Yucatán (Inccopy by initials in Spanish) and the builder Carlos Ancona Riestra. “Do your own drainage, I will not take all the water from the street,” insisted the manager, who with the heel of his foot showed the highest height of the new street. “We built enough drains,” said the director of Inccopy. And in fact the Hyatt will donate a bit of its front garden area to increase the pedestrian sidewalk of Colón Avenue, but the manager was alarmed by the new design of the street and sidewalk because he fears that the unevenness they will build for the access of vehicles over the avenue drains rainwater to the underground parking lot. García Vales, who is the governor’s private secretary, also reported that with the new design of that section of the hotel zone, the installation of fixed and automatic bollards to delimit sidewalks and traffic lanes, may permit staging events similar to the Rosca de Reyes (Giant Bread) of the Epiphany Day. The hoteliers immediately took the idea and told the governor that they could close the street at night on weekends as it is done downtown. The idea was not to the taste of the leader of the National Chamber of Commerce (Cámara Nacional de Comercio, Canacome, in Spanish), Juan José Abraham Dáguer, because he said that would cause more damages to Meridanos because it is proven that the closure of streets damages the road operations of the city. 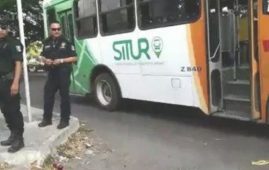 Another dart launched by Garcia Vales during the explanations is that when the rescue of the area is complete, the taxi drivers stand that for years has occupied part of the lane on 60th street next to the Hotel Fiesta Americana will be removed. Enríquez Soberanis said that the taxi drivers will be removed from the site because the 60th street has to be totally free. 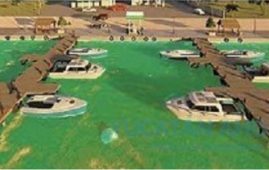 The promoter of the rescue of Avenida Colón, federal deputy Jorge Carlos Ramírez Marín, said he is very proud of the work done. He had the part of fighting for the budget to do the work, it was consolidated, and now the state government concretizes the project. 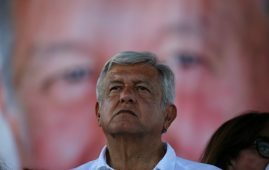 In his opinion, the government sends a very clear signal with this work: Yucatan is no longer for patchwork, and you have to do things well. We need new roadways of the quality of the avenue, without power lines, with enough drain collectors, with professional illumination and that there is no doubt about the execution and legality of the project.